Quick to knit up in bulky weight yarn in three sizes. 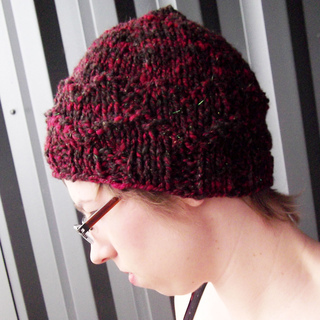 Subtle hearts are outlined in purl bumps above the ribbing. Seno means “bosom” or “heart” in Spanish. X-Small (medium, large); 16.5 (20, 23) inches around. Shown in medium. 65 (70, 85) yards bulky weight yarn- sample knit in bulky weight wool blend handspun from Midnightsky Fibers.